Gold is a symbol of noble and wealth since before historic times. Its color and brightness are being fascinated us. Pure gold (K24) is soft and easy deformed, 18 gold (K18) which is contained silver and copper is used to be used for jewelry like ring and necklace. By the metal compounded to the gold, we can make many kinds of gold colors. “MIZ JAPAN COLLECTION” is dealing with 4 kinds of gold color – 18KT yellow gold, 18KT rose gold (pink color), 18KT white gold (platinum color), and 14KT white gold, total 3 colors. Silver is soft and easy deformed comparing with gold and platinum. It is called Sterling Silver (Silver 925) which is compounded by 92.5% Silver and 7.5% Copper. It is mostly used for luxury brands’ silver jewelry. “MIZ JAPAN COLLECTION” are making solid silver spectacle frames by using machine pressed harden sterling silver. Using some parts like screws are made from palladium alloy and/or stainless in order to raise the strength. Chemical treatment like prevent discoloration is not done on the surface of silver frames. The brightness on the surface will be lost and became dark. We have antique finish models using sulfide at the final process and make frame antique color. Elegance and shinning in white and beautiful, platinum is called “Precious metal in Heaven” as everlasting symbol of innocence. It is mining only limited area on the earth and mining amount is not so big, so it is very scarcity and special material. It is also called “Precious metal suitable for King only” and “Platinum is the King of the precious metal”, platinum is the highest precious metal which had been loving all over the world from the ancient till now. Platinum is very stable precious metal from the point of scientific. It is no need to worry about deterioration and tarnish during our daily life. Admitted as platinum jewelry is 95% contents of platinum. The platinum frames of “MIZ JAPAN Collection” are using PT950 (95% of purity) Using some parts, screws are in 18KT white gold, in order to raise the strength. Sun Platinum was developed in the Japanese market in 1930. It is Alloy compounding Nickel, Chromium, Silver, etc. It has an affinity for human body, and good against corrosion resistance. It almost does not discolor in the atmosphere without doing surface treatment. Not only for the material for optical, but also used for dental material, accessory, and plastic surgery, etc. Round type eye-shape made from this material is favorite of the Showa Emperor, and it is spread to the people. Although this material is named SPM (Sun Platinum Metal), “Platinum” is not included in this material. Gold is not included, neither. This material is included nickel, the person should take care who has metal allergic. Lighter than gold and stronger & flexible comparing with silver. High rank material which has white brilliance like platinum. APC is a compound of Silver (Ag), Palladium (Pd), and Copper (Cu) take each initial and called as APC. Its finish of the product will be lighter comparing with the same volume of platinum and gold products. “MIZ JAPAN Collection” has combination frames of metal and wood. The wood parts used for “Plus wood model” are sustainable harvested wood of Japanese cedar Beautiful grain and warm feeling of the material is the peculiar feature of wood. With special strengthen cedar board are processed accurately one by one and make small block parts. Pierce a hole in each block parts and tie them like rosary. It is available to fit customers’ face by moving each of small block parts. Not only individuality but also using wood material and functionally, it is draw a clear line between “MIZ JAPAN Collection” original wood frame and traditional wooden frames. Other kinds of woods materials and another designs are also available. Hybrid Opal is the revolutionary new material which has been developed based on the results obtained by research group of the Academic-Industrial Collaboration from the space test made in the International Space Station (ISS). 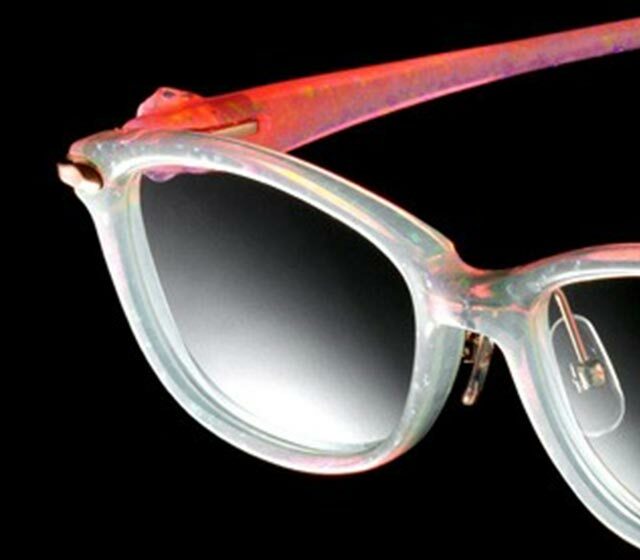 Synthetic Hybrid Opal can make the larger size crystallization which can not make from the natural opal, and it becomes possible to make front and temples for optical frames. Comparing with the natural opal, beautiful play of color effect will be expressed in a stable manner. This play of color is only available from the structure of opal, other materials can not imitate it. The temple made from Hybrid Opal can be fitted by heat. Hybrid Opal is the new materials which evolves of the standard synthetic opal. And so, depend on the institution for identification, it may not obtain as "Synthetic Opal" through the result of judgment.